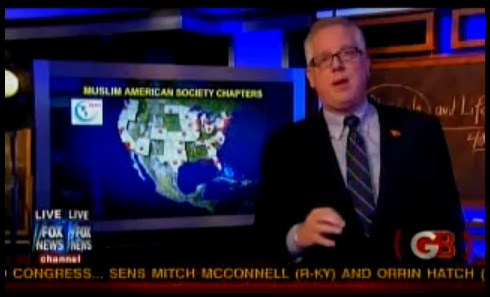 Glenn Beck, who apparently has entirely abandoned his 2011 ‘e4 enlightenment plan‘ in the face of the uprisings in Egypt, is now seemingly convinced that the Muslim Brotherhood, perhaps with the help of Van Jones and the SEIU, is plotting a caliphate in America. Over the weekend conservative soundbite machine Bill Kristol wrote that Beck was marginalizing himself with his caliphate conspiracy theories. Which I took to mean that Kristol felt he was not getting enough attention in the current Egypt news cycle and couldn’t count on a Sarah Palin reference to generate it. But after watching Beck’s latest ‘explanation’ of how the Muslim Brotherhood may be attempting to take over America I think he may actually have a point. But again, maybe irrelevant is the wrong word. One the hand Beck is certainly going to make himself irrelevant to the portions of the country and the media who now consider him mainstream. And believe me, he wants to be mainstream. Meaning, among other things, this caliphate business is probably bad for business. However, he is certainly not making himself irrelevant to people like the well-educated, reasonably well-off, business-owning couple I met on the Amtrak train back from Beck’s DC rally in August who, after a pleasant and lengthy conversation, wished me good luck with my career and that they hoped I would never have to wear a burka and be ruled under sharia law. And while I’m the last person to jump on the ‘Glenn Beck is scary’ panic wagon, that is a problem. Though probably as much, if not more, for Beck than for everyone who watches him. At the end of the day, the sustained paranoid conspiracy theory is sort of the equivalent of the television show marriage and/or baby: it’s lazy and it’s a sure sign that whatever you are watching is about to jump the shark. And mainly you just end up sticking around to see how bad the crash is. Also, Beck hates Al Jazeera (and their full page NYT ad). Which is disappointing.